Diabetes mellitus—Persons with diabetes are at higher risk for cataracts. Drugs—Certain medications have been found to be associated with the development of a cataract. Ultraviolet radiation—Studies have shown that there is an increased chance of cataract formation with unprotected exposure to ultraviolet (UV) radiation. Smoking – An association between smoking and increased nuclear opacities has been reported. Alcohol – Several studies have shown increased cataract formation in patients with higher alcohol consumption compared with people who have lower or no alcohol consumption. Nutritional deficiency—Although the results are inconclusive, studies have suggested an association between cataract formation and low levels of antioxidants (e.g. vitamin C, vitamin E, carotenoids). Further studies may show that antioxidants have a significant effect on decreasing cataract development. Rarely, cataracts can be present at birth or develop shortly after. They may be inherited or develop due to an infection, i.e. rubella, in the mother during pregnancy. A cataract may also develop following an injury to the eye or surgery for another eye problem, such as glaucoma. While there are no clinically proven approaches to preventing cataracts, simple preventive strategies include reducing exposure to sunlight through UV blocking lenses, decreasing or discontinuing smoking and increasing antioxidant vitamin intake through consumption of leafy green vegetables and nutritional supplements. Patient history to determine vision difficulties experienced by the patient that may limit their daily activities and other general health concerns affecting vision. Visual acuity measurement to determine to what extent a cataract may be limiting clear vision at distance and near. Refraction to determine the need for changes in an eyeglass or contact lens prescription. Evaluation of the lens under high magnification and illumination to determine the extent and location of any cataracts. Evaluation of the retina of the eye through a dilated pupil. Measurement of pressure within the eye. Supplemental testing for color vision and glare sensitivity. Additional testing may be needed to determine the extent of impairment to vision caused by a cataract and to evaluate whether other eye diseases may limit vision following cataract surgery. Using the information obtained from these tests, your optometrist can determine if you have cataracts and advise you on options for treatment. The treatment of cataracts is based on the level of visual impairment they cause. If a cataract affects vision only minimally, or not at all, no treatment may be needed. Patients may be advised to monitor for increased visual symptoms and follow a regular check-up schedule. In some cases, a change in eyeglass prescription may provide temporary improvement in visual acuity. Increasing the amount of light used when reading may be beneficial. The use of anti-glare coatings on clear lenses can help reduce glare for night driving. When a cataract progresses to the point that it affects a person’s ability to do normal everyday tasks, surgery may be needed. Cataract surgery involves removing the lens of the eye and replacing it with an artificial lens. The artificial lens requires no care and can significantly improve vision. New artificial lens options include those that simulate the natural focusing ability of a young healthy lens. Small incision cataract surgery involves making an incision in the side of the cornea, the clear outer covering of the eye, and inserting a tiny probe into the eye. The probe emits ultrasound waves that soften and break-up the lens so it can be removed by suction. This process is called phacoemulsification. Extracapsular surgery requires a somewhat larger incision in the cornea and the lens core is removed in one piece. Once the natural lens has been removed, it is replaced by a clear plastic lens called an intraocular lens (IOL). For situations where implanting an IOL is not possible because of other eye problems, contact lenses and in some cases eyeglasses may be an option to provide needed vision correction. As with any surgery, cataract surgery has risks from infection and bleeding. Cataract surgery also slightly increases the risk of retinal detachment. It is important to discuss the benefits and risks of cataract surgery with your eye care providers. Other ocular conditions may increase the need for cataract surgery or prevent a person from being a cataract surgery candidate. Cataract surgery is one of the safest and most effective types of surgery performed in the United States today. Approximately 90 percent of cataract surgery patients report better vision following the surgery. A cataract is a cloudy or opaque area in the normally clear lens of the eye. Depending upon its size and location, it can interfere with normal vision. Most cataracts develop in people over age 55, but they occasionally occur in infants and young children. Usually cataracts develop in both eyes, but one may be worse than the other. Reasearchers have linked eye-friendly nutrients such as lutein/zeaxanthin, vitamin C, vitamin E, and zinc to reducing the risk of certain eye diseases, including cataracts. For more information on the importance of good nutrition and eye health, please see the diet and nutrition section. The lens is located inside the eye behind the iris, the colored part of the eye. The lens focuses light on the back of the eye, the retina. The lens is made of mostly proteins and water. Clouding of the lens occurs due to changes in the proteins and lens fibers. A nuclear cataract is located in the center of the lens. The nucleus tends to darken changing from clear to yellow and sometimes brown. A cortical cataract affects the layer of the lens surrounding the nucleus. It is identified by its unique wedge or spoke appearance. 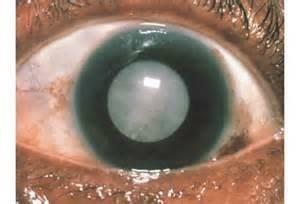 A posterior capsular cataract is found in the back outer layer of the lens. This type often develops more rapidly. Normally, the lens focuses light on the retina, which sends the image through the optic nerve to the brain. However, if the lens is clouded by a cataract, light is scattered so the lens can no longer focus it properly, causing vision problems. While the process of cataract formation is becoming more clearly understood, there is no clinically established treatment to prevent or slow their progression. In age-related cataracts, changes in vision can be very gradual. Some people may not initially recognize the visual changes. However, as cataracts worsen vision symptoms tend to increase in severity.